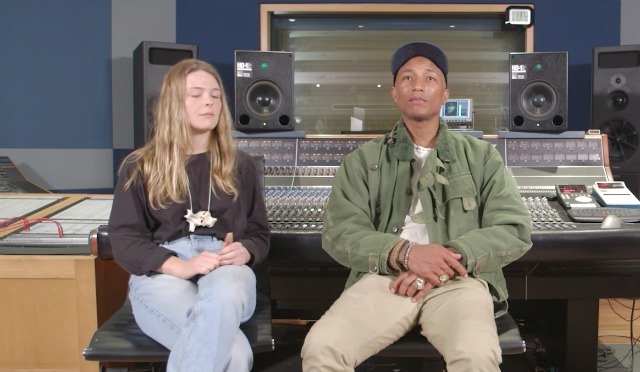 Pharrell Williams sat down with NYU student Maggie Rogers as he hosted a masterclass for the Clive Davis Institute of Recorded Music. There are those moments you hear a song and are incredibly taken aback. The melody hits an instant chord in your soul; the rhythm sends chills down your spine; and the heart of the creator is incredibly resonant. That’s the case with Pharrell Williams as he sat down with NYU music students at The Clive Davis Institute of Recorded Music as the university’s artist-in-residence. Williams hosted a masterclass back in March and listened to students’ projects, providing constructive criticism and discussing the nature of the creative process. Maggie Rogers, a student with an upbringing in folk and banjo music, with a natural inclination towards the outdoors, mentioned her spiritual experience with dance music when she studied abroad in France to Williams. “Suddenly this thing that had always been the most unnatural and the most artificial, I understood the release of it,” Rogers mentioned. Listen to Rogers’ demo track and session with Williams herself below. And if I have anything to add, I was incredibly impressed and moved by her track. The natural imagery it evoked, the transcending heart in the track, and the soul of the singer-songwriter… You could feel and hear her own personal journey through music with the track as she has created something entirely from her heart and entirely from her own. And it’s such a rare energy to come by, that I instantly fell in love. Like Williams, I was in disbelief. Some songs can move your heart and bring your mind to tears because they are that beautiful and genuine.